Detecto Portable Bariatric Wheelchair Scale is designed for heavy-duty use. 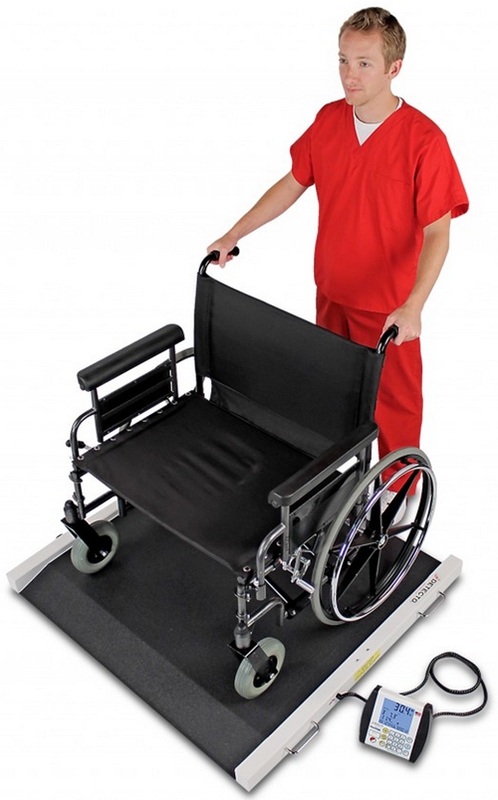 This Portable Wheelchair Scale can be moved to accommodate the needs of the patient. With a capacity of 1000 pounds, this Bariatric Scale accommodates manual wheelchairs, power wheelchairs, dialysis patients and walk-on patients. 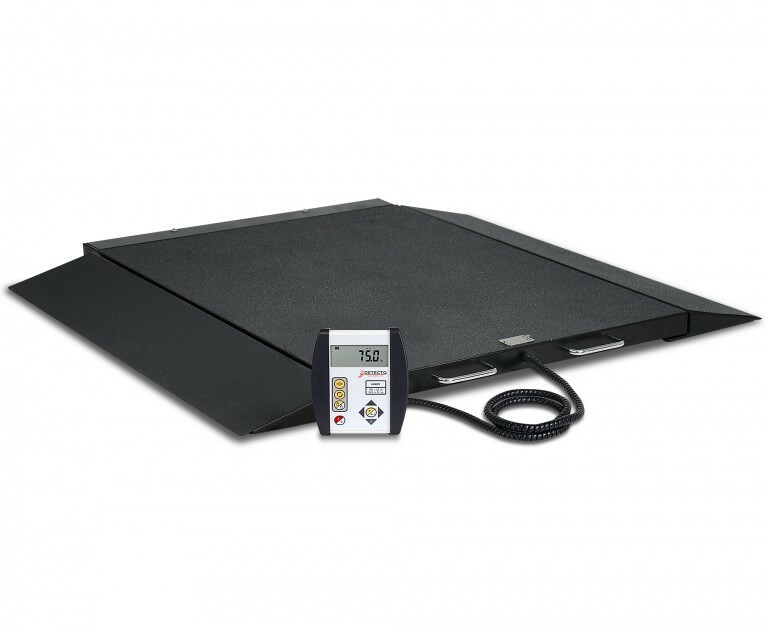 Manufactured by Detecto, these scales are made with clinical-grade construction, this Bariatric Scale provides a low profile platform that allows wheelchair entry from two directions. Easy access ramps are built into the scale platform to provide easy wheelchair loading and off-loading. The platform size is spacious, measuring 40 x 30 inches to serve oversized bariatric wheelchairs. Made in the USA, this portable wheelchair scale has wheels integrated into the lightweight frame for easy moving from room to room. Built-in carry handles also make this Detecto Wheelchair Scale easy to carry with you. This bariatric wheelchair scale features the most level surface for weighing because it has stainless steel load cells and self-aligning feet. This Bariatric Wheelchair Scale uses MedVue weight indicator. It provides weight, height and body mass index (BMI) for any bariatric patient. The measurement data may be outputted to EMR or HER software through a standard RS232 Serial port or USB ports. An optional Wi-Fi Ethernet connection is also available. The Detecto Bariatric Wheelchair Scale also interfaces with a personal computer or printer. This Portable Bariatric Wheelchair Scale stores up to 99 tare weights to compensate for the weight of the wheelchair. This Bariatric Scale has a Hold/Release button to retain weight after the patient leaves the scale platform. 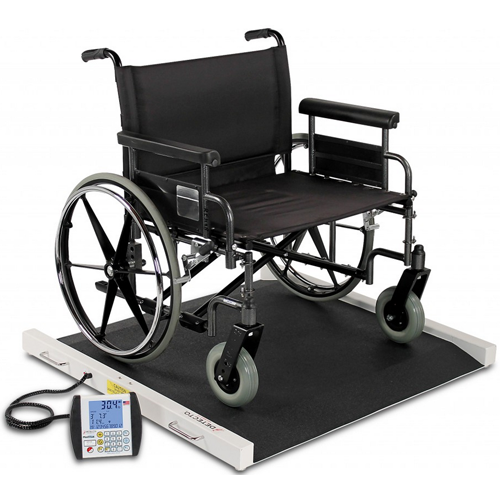 The 6600 scale is also a bariatric wheelchair scale that supports up to 1000 pounds. It has a 2-way access ramp. A black rubber mat offer better traction. This scale uses the Model 750 weight indicator that provides basic weighing functions, including BMI calculation, RS232 serial port, and big bold LCD digits. It uses 6 AA batteries. 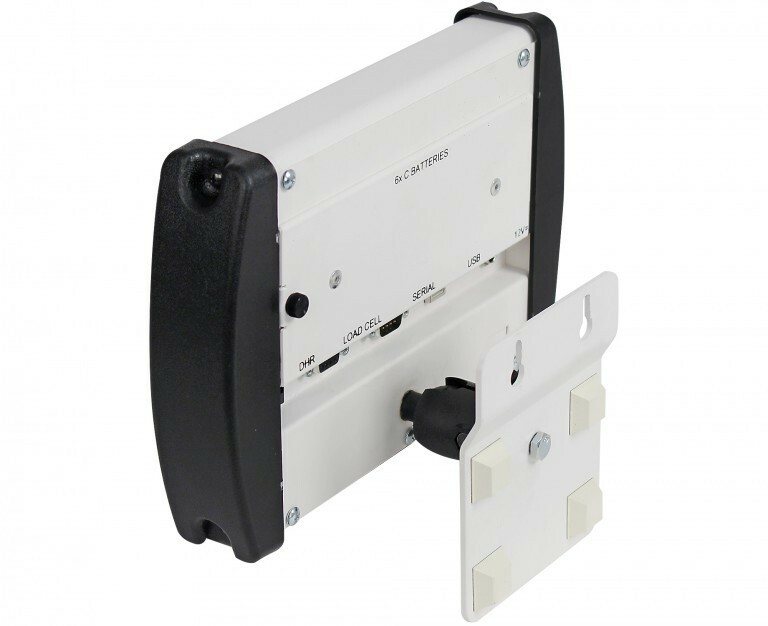 Additional scales manufactured by Detecto that may be of interest to you include the Wall Mount Wheelchair Scale, the Roll-A-Weigh Scale and the Mechanical Staionary Wheelchair Scale. Accommodates new extra-wide wheelchairs up to 40 inches wide. Stores weight of wheelchair (tare) for quick patient weight calculation. Integrated carrying handle makes portability easy. Integrated wheels provides mobility from room to room. Platform Dimensions: 40 W x 30 D Inch. Color: White with Black Base. Keyboard: Membrane with 19 keys. AC Power Supply may be special ordered. Application: To measure weight and body mass index. Platform Size: 32 x 36 x 2.2 Inch. Ramp Size: 36 W x 7.9 L Inch. 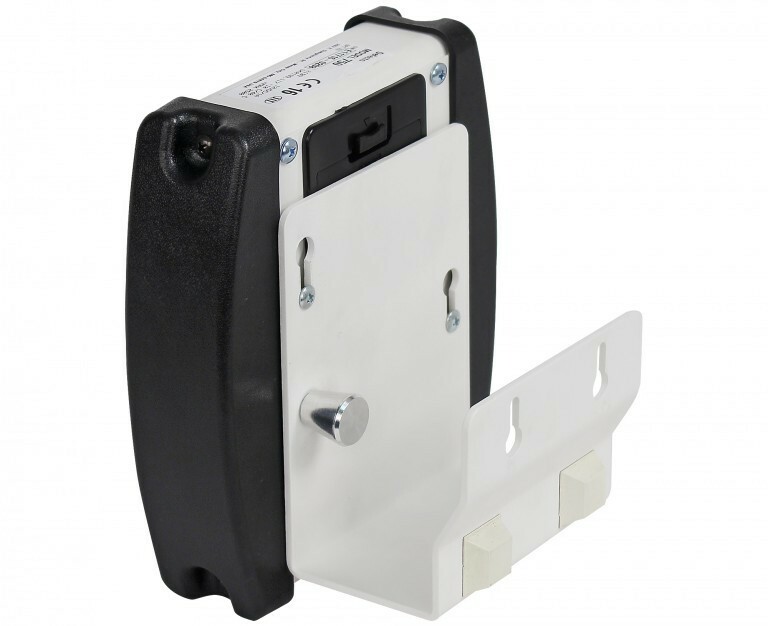 750 Weight Indicator Dimensions: 6.1 W x 6.8 H x 1.8 D Inch. Capacity: 1,000 lb / 450 kg. Connectivity: RS232 serial, USB, Ethernet. Cable Length (from scale to indicator): 6 Foot. Keypad Functions: ON/OFF, ZERO, UNITS, LOCK/RELEASE, BMI/ENTER, PRINT, arrow keys. Portable Wheelchair Scales Brochure contains features and benefits of Detecto scales designed of bariatric and wheelchair patients. Detecto BRW1000 Operating Instructions presents information for the correct use of this weight scale. 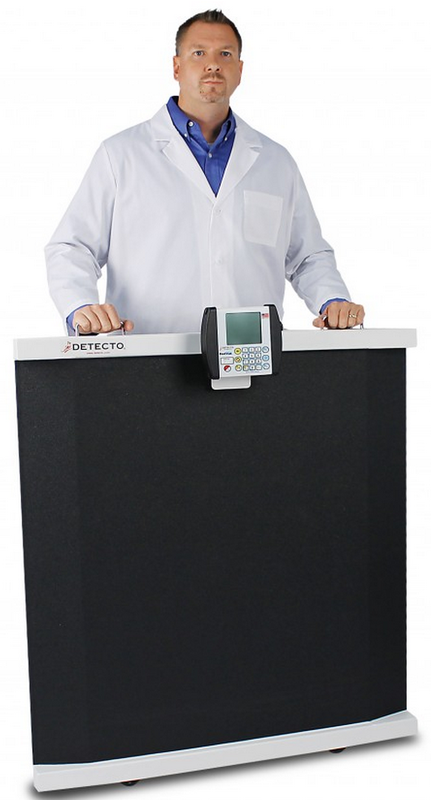 Detecto 6600 Scale Operating Instructions provides detailed instruction for setup and use of this portable scale. MedVue User Manual provides instructions for using this electronic weight indicator. Detecto 750 Weight Indicator Owners Manual provides instructions for operating and setting the indicator. 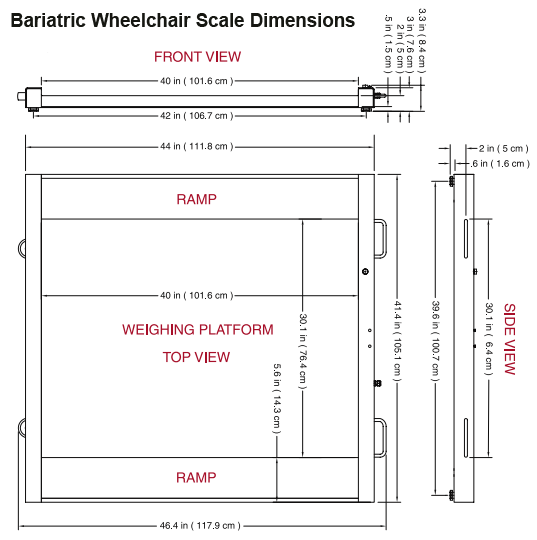 Portable Wheelchair Scale Ramp Instructions offers information to safety use the scale ramp. Material Data Safety Sheet for BRW1000 contains MSDS information.